2 degrees – Almost every government in the world has agreed that any warming above a 2°C rise would be unsafe. We have already raised the temperature .8°C, and that has caused far more damage than most scientists expected. A third of summer sea ice in the Arctic is gone, the oceans are 30 percent more acidic, and since warm air holds more water vapor than cold, more frequent devastating floods and drought are inevitable. 565 gigatons – Scientists estimate that humans can pour roughly 565 more gigatons of carbon dioxide into the atmosphere and still have some reasonable hope of staying below two degrees. 2,795 gigatons – The Carbon Tracker Initiative, a team of London financial analysts and environmentalists, estimates that proven coal, oil, and gas reserves of the fossil-fuel companies, and the countries (think Venezuela or Kuwait) that act like fossil-fuel companies, equals about 2,795 gigatons of CO2, or five times the amount we can release to maintain 2 degrees of warming. In other words we have to keep 80% of the known fossil fuels reserves underground to keep the earth in livable shape. 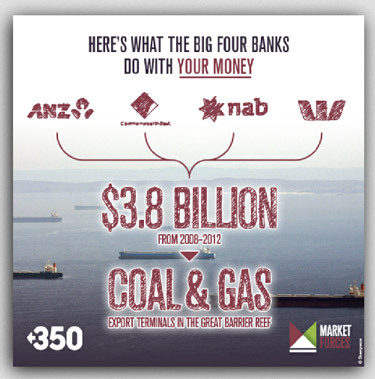 And yet banks, super-funds and governments are still pouring money into more fossil fuel exploration and development. Is that crazy or what? It’s a carbon bubble that’s bound to burst. 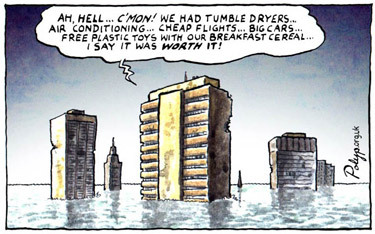 If we can’t convince financiers to divest in an orderly way there will be an almighty financial crash. The exposure to these dirty investments will inevitably crash in value as the global community progressively outlaws fossil fuel development and use. Take part in the Bill McKibben roadshow. If you can’t make it, at least watch the video on YouTube. But do go to one of the events if at all possible; we all need the extra motivation, and the public – and our politicians – need to see a mass movement taking shape. Bill’s National Press Club presentation will be shown on ABC News 24 TV tomorrow (June 6th) and presumably on ABC iView subsequently. Write a letter to your bank and superannuation funds, advocating strongly for them to announce their divestment plans. You might find my letter to the ANZ Bank a useful starting point. Write to the management team at the Australian Government Future Fund seeking a divestment announcement from them. In the end, money is the only language that corporations understand. If they won’t listen to ethical and logical arguments about moving away from dirty fossil fuels to sustainable green power, then cutting off their financial foundations is the only path left to us. This entry was posted in Activism, Climate change, Environment, Renewable Energy and tagged 350.org, activism, Bill McKibben, capitalism, climate change, climate disruption, divestment, future, politics, renewable energy, solar power by Brian Loffler. Bookmark the permalink.